When a man wakes up in the morning it starts a chain of events that leads to him going back to sleep at the end of the day. Stars Shane Crawford. 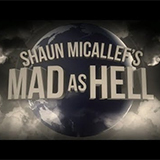 Shaun Micallef's MAD AS HELL was broadcast on ABC1 at Tuesday 16 April 2019, 01:29.